Russia’s recent presidential elections once more provided an emphatic win for Vladimir Putin. Securing his fourth consecutive term in office with a huge 77% of the vote, Putin defied the odds, a constitution which limits consecutive terms to two, accusations of voting irregularities, and the assassination and imprisonment of the other candidates. A thoroughly deserved win then! The run-up to the election which delivered Putin’s decisive victory was also assisted by a thorough and active police force, ensuring the the Russian people were safe and secure to cast their all-important vote. Many vehicles were deployed to this end, but our favourite is this, the GAZ Tigr SPM-2. With 7mm armour plating, a four foot wading depth, and powered by a 5.9 litre Cummins diesel engine, the GAZ Tigr is the perfect vehicle for Russia’s armed forces to traverse their country’s vast and varied landscape. It’s also large enough to hold a number of police officers plus any citizens that are as yet unsure of whom to vote for. This brilliant police-spec Technic GAZ Tigr SPM-2 comes from previous bloggee filsawgood and instead of containing undecided voters/rival political candidates it’s stuffed full of technical wizardry. All four independently suspended wheels are powered by a pair of BuWizz bluetooth bricks controlling four Large drive motors and Servo steering motor, whilst a Medium motor powers the front-mounted winch. There’s also a six-cylinder piston engine, opening hood, doors and sunroof, and a fully appointed interior ready to receive any political dissidents. There’s lots more to see of filsawgood’s hugely impressive GAZ Tigr SPM-2 at both Flickr and the Eurobricks discussion forum – take a look via the links above and remember to show your support for the President in the comments. A delicious if overly sugared snack, the rocky road would be a sure Elven favourite if ever we allowed them to have it. Or if they knew what it was. Today’s lucky Elf is about to receive its own sugary hit thanks to this multiple-vehicle find. Built for LEGO’s ‘Great Mountain Chase’ contest, this brilliant scene from Flickr’s Pixel Fox depicts a pair of bank robbers attempting escape from their Police pursuers, who they surely didn’t expect to have access to a monster off-roader and a dirt bike. Pixel has created his landscape from actual rocks to form the mostly-dry river bed, and it comes complete with a startled fisherman and a pair of hikers whose day just got a lot more interesting. See more of the scene and place your bets on the outcome at Pixel Fox’s photostream by clicking here. The District 18 Speeder Competition run by the Lego Speeder Bikes group is gathering pace. This entry is the work of Pico van Grootveld and it’s been build for the ‘Enforce’ category of the contest, featuring a rather smug looking cop aboard an incredibly speedy-looking, er… speeder. There are three other categories to choose from and prizes up for grabs too. Take a look at Pico’s submission via the link above and you can see the other entries and submit a model yourself by visiting the Lego Speeder Bikes group. The relentless pace of uploads by Flickr’s de-marco continues, with his two latest builds delightful slices of classic Americana. Above is a lovely 6-wide Plymouth Fury, before things turned strange courtesy of a Stephen King novel, whilst below is a neat 1960s police car in a rare blue-over-yellow paint scheme. There’s more to see at de-marco’s photostream via the link above, where there are also instructions for each model available! With The Lego Car Blog’s home nation victim of a terror attack this week we’re acknowledging the incredible work that our emergency services perform in the face of horrific acts of violence. NHS paramedics, doctors, nurses, cleaners and caterers, bomb disposal teams, the Greater Manchester Police, and of course the people of Manchester, demonstrated the very best of British society in the aftermath of the May 22nd attack. Our police officers don’t get to drive big RWD V8-engined sedans, although their fast-response BMW, Audi and Volvo diesels look quite fun, but they’re the backbone of the US and Australian forces’ fleets. Big, wallowing, and not actually that fast, RWD V8 sedans really aren’t suited to European policing, but that doesn’t stop them being – at least to our eyes – quite cool. This neat generic Police Interceptor comes from previous bloggee pipasseyoyo, and it features the obligatory V8 engine hooked up to a four-speed gearbox, rear-wheel-drive, working suspension and steering, opening hood, trunk and doors, and a deployable spike-strip to apprehend the bad guys. There’s more of pipasseyoyo’s Technic Police Interceptor to see at his Brickshelf album via the link above, and if you’re reading this and represent one of the emergency services, wherever you are; thank you. 2016’s brilliant ‘Zootopia’ showed us no matter what we look like on the outside, it’s what’s inside that counts. The same is certainly true for this recreation of the meter maid police cart from the movie by Flickr’s Sheo. A glorified golf cart it may be, but Sheo’s build has more packed inside it than many Technic Supercars. There’s fully independent suspension, remote control drive and steering, a four-speed sequential gearbox(! 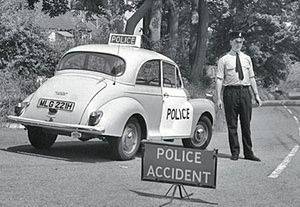 ), a working windscreen wiper, illuminating headlights and rotating flashing beacons. There’s a whole lot more to see on Flickr, MOCpages and Eurobricks, where you can also watch a video of the meter maid in action. This magnificent Harley Davidson Electra Glide motorbike, in full Police Department specification, was found on Flickr today. It’s the work of previous bloggee Andre Pinto and it’s been beautifully chromed by Bubul Chrome to make it shinier than any LEGO set. There’s lots more to see at Andre’s photostream – click here to dial 9-1-1.